England will name their 31-man squad for the Rugby World Cup on Thursday, 27 August at 13:45 BST. Head coach Stuart Lancaster must cut eight players from the 39-strong squad that won one and lost one of their two warm-up games against France. Saturday's 25-20 loss in Paris followed a 19-14 win at home the weekend before. England host Ireland on 5 September in their final warm-up match before facing Fiji in the World Cup opener at Twickenham on 18 September. 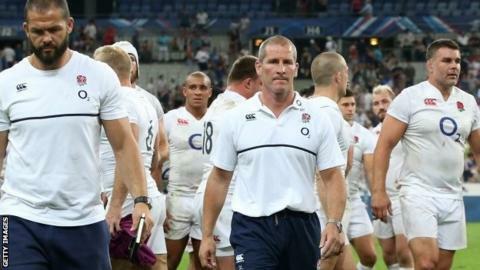 Lancaster admitted after the defeat in the French capital that he still had selection issues. Utility back Danny Cipriani, number eight Nick Easter and lock Dave Attwood all impressed off the bench as England outscored France 14-10 in the second half. Cipriani scored a try but has tough competition with Mike Brown and Alex Goode for the full-back role, while George Ford and Owen Farrell stand in his way at fly-half. Rugby league convert Sam Burgess made a solid debut at centre in the first game at Twickenham but faces competition from Henry Slade, Luther Burrell and Billy Twelvetrees for a place in the squad. Former England scrum-half Matt Dawson, who was part of England's World Cup-winning side in 2003, said coach Lancaster had several "selection headaches". "Most of the bench played well," the 42-year-old added. "Nick Easter, Jamie George, Danny Care and Cipriani. I can understand why they'd take Burgess but he wouldn't be in my 31. "Slade played out of his skin and looked like he could do that week in, week out. Sam's inclusion will be based on more than what he did at Twickenham. His off-field influence is well received by the management."